If it has to do with harpsichords, clavichords, fortepianos, or antique pianos, I probably do it. Stringed keyboard instruments are my passion and my world. In addition to my hands on work, I am a dedicated player, researcher, writer and lecturer. Research, performance, building and repairs all come together to inform one another. Each instrument has to rise to my playing and historic standards. Whether you would like to acquire an instrument, new, used, or antique, or restore, repair or decorate one you already have, get an appraisal or evaluation, schedule a tuning or concert services, I am happy to be of service. My territory ranges from Maine to Miami with regular visits to Georgia, North Florida, Virginia, North Carolina, Washington D.C. and Maryland, Manhattan, New York, Philadelphia, and special trips into the midwest and Canada. In addition to working in my workshops in Savannah, Georgia or Montrose, Pennsylvania, (just a few hours out of Philadelphia, Washington, DC and New York City), I hit the road many times during the year stopping to work on or evaluate instruments, as well as pick up or deliver. My clients range from private individuals, collectors, professional musicians and amateurs, as well as churches, performing groups, universities, historic homes and museums. I work at keeping myself current in the field by being involved with professional organizations of musicologists, builders, piano technicians and museum curators. • Custom Instruments and Decoration: either new or using your existing ugly duckling. 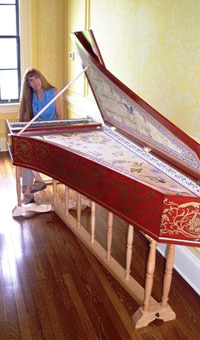 • Service: build new instruments, antique piano restorations, kit completion, tunings, repairs, complete harpsichord restorations, maintenance, evaluations, appraisals, rescaling, research, rebuilds, the near impossible! Sow's ears to silk purses our specialty. • The highest quality early keyboard instrument kits from The Paris Workshop.